Forums » Professional Video Editing & Finishing Forums » Media Composer | First Forum » Avid Media Composer FIRST crash report AFTER startup ! Latest post Fri, Oct 26 2018 1:47 PM by RalphC. 6 replies. I downloaded Avid Media Composer and when i launch it, the startup work perfectly, every files is charging. The problem is after that, the software is crashing randomly between 10 at 40 seconds after the startup. The problem is not when i press or do something specific because even when i don't touch anything the Application crash. I took a screenshoot of the screen report below. My pc : Laptop, windows 10, 16go ram, i7, GTX 1060. I already tried to reinstall Avid like 3 times. PS : Sorry for my bad english, i'm french. 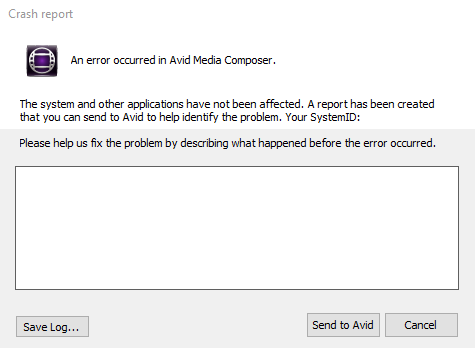 Re: Avid Media Composer FIRST crash report AFTER startup ! Can you post the machine CPU specs. Thanks! Do you just want these informations ? If you have an integrated graphics adapter you can set it for MC|First. Now select the 'preferred graphics processor' in the drop-down list (you can see what the automatic option is listed as a global setting). If you want to use the dedicated graphics card, select High-performance Nvidia processor. I donwloaded Adobe Premiere Pro because of the fact that MC donc work, and i have EXACTLY the same problem with premiere, i launch it and it crashes after 10/40 seconds after launch, without any errors. Did you update your Windows to Windows 10 1809 when it was launched Oct. 2nd? Update: What is the exact model of the laptop?